There Has Never Been a Better Time to Invest in Some New Equipment! Spring is here, and so is our Spring-Up Deals campaign! Packed full of deals and special pricing, our Spring-Up Deals flyer is sure to impress! 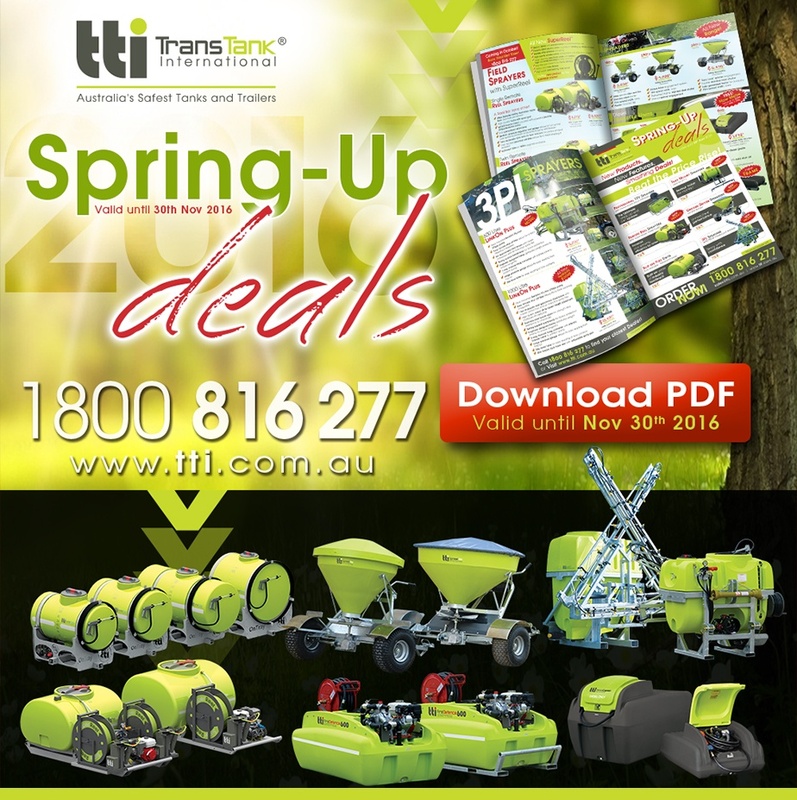 We’re using the start of Spring as an opportunity to launch some great new additions to the TTi product range. Our new range of SpreadRite units are effective and efficient, coming packed full of features to make spreading Urea easier. Made with a UV stabilised, corrosion resistant poly hopper, and stainless steel adjusting plates for precision application, the SpreadRite evenly distributesfertilisers and seeds up to 18m. The extra wide wheel base provides superior safety for uneven and hilly terrain and floatation tyres make for better traction and less soil compaction. The ALL NEW SuperReel is almost here, with production starting on October 1! An exciting new product for the Australian market, the powerful 500W electric motor is capable of winding up 200m of hose and the high quality remote control works with up to 400m line of sight. We’ll initially be adding these reels to our TopCrop units, with the option of a single or twin remote units. These reels will increase your spraying productivity by miles! The new range of OnTray sprayers provide impressive performance with their 7.5L/min 100psi 12 volt pump, 4m x 10mm spray hose and heavy duty adjustable lance. The tank is fully drainable for ease of cleaning and flushing, and the pressure regulator and gauge are mounted securely under the main tank for protection. We’ve added a couple of new LinkOn Plus units to the collection, including the 600L (new model) and 1000L with all new hydraulic boom. These LinkOn Plus units include a rear mounted Bertolini 75L/min 218psi pump, as well as an engineer designed frame that distributes weight evenly to ensure longevity. The included site level tube allows for easy reading of the tank contents.